Former Heisman Trophy winner and "World’s Greatest Dad" O.J. Simpson was arrested on Sunday and held on multiple felony charges in connection with an alleged robbery. Police say that Simpson and several other men were involved in — can I call it a "caper"? Don’t see why not — a caper at the Palace Station casino-hotel in Las Vegas last Thursday night in which they barged into a room and took some of Simpson’s sports memorabilia. Simpson had been questioned immediately after the incident, but no one was taken into custody until today. 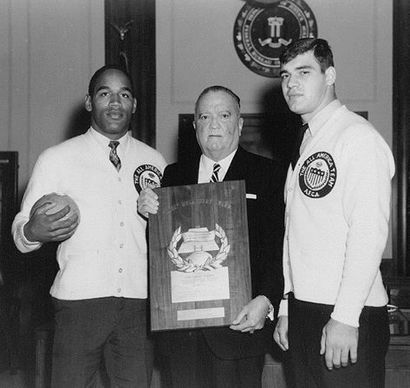 Simpson admitted last week that he had been in the room, but said no guns were involved and that he went there only to recover mementos that had been stolen from him to begin with, including his Hall of Fame certificate and — most importantly — a picture of Simpson with former F.B.I. director J. Edgar Hoover. Simpson said he had been called several weeks ago by an auction-house owner named Tom Riccio, who told him that some "collectors" had a lot of his "stuff" and were planning to quietly sell it. Conveniently, Simpson happened to be in Las Vegas that week anyway, and he arranged to meet Riccio, who had set up a meeting with the "collectors" without telling them O.J. was involved. According to those in the room, Simpson and six or seven other men came "busting through the door . . . with guns, hollering and screaming," took Simpson’s stuff and left. Riccio, who claimed that the intent had been to either peacefully reclaim the stuff or call police, admitted that things had gone "haywire." According to the Associated Press, "Simpson said he was accompanied by several men he met at a wedding cocktail party, and they took the collectibles." (Emphasis added.) "We walked into the room," he told a reporter. "I’m the last one to go in, and when they see me, it’s all ‘Oh God.’" But he said there were no guns and "nobody was roughed up." Simpson admitted that he had not called the police to help, but said this was because he seems to have found the police unresponsive to him in recent years. Or, as he put it, "[t]he police, since my trouble, have not worked out for me." It appears that by "my trouble," Simpson is referring to allegations that he was somehow involved in the murder of his ex-wife and another man in 1994, although he was acquitted of that crime and so it seems to have all been a big misunderstanding. It must have been a very traumatic experience for him, because otherwise you really wouldn’t expect to hear a man describe the savage murder of two other people as "my trouble." Perhaps the men in the room had heard something about these ridiculous allegations, so that "Oh God" may have meant something like "Oh God, please don’t nearly cut our heads off as we’ve heard a still-unidentified person or persons did to your ex-wife for reasons still unknown." This is the kind of stigma that O.J. apparently has had to live with since his trouble. Anyway, I’m sure the truth about that will come out as part of the investigation into the Palace Station caper. Another man was arrested Saturday night in connection with the same incident, after police searched two or three other residences (they did not say whose) and said they had found evidence of the crime. Whether or not they recovered the precious J. Edgar Hoover memento is currently unknown.